An ultramarathon, run by a master of the sport, becomes a metaphor for the race for human sustainability we are all running. Ed Ayres has been running competitively for more than half a century. On a professional basis, he’s also studied climate change, sustainability and a variety of issues facing the future of the human race and our planet. 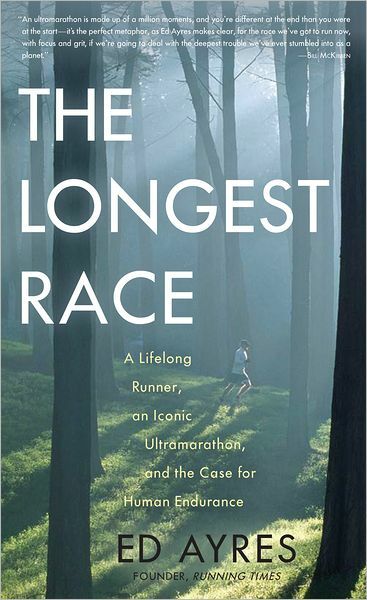 The Longest Race is the story of his 2001 run at the JFK 50 Mile, the United States’ oldest ultramarathon. As Ayres attempts, at age 60, to set a new age-group course record, he contemplates the relationship of human endurance to the sustainability of human life in a fast-changing world. Ayres’s recollections a decade later are heavy on metaphor. The ultramarathon is a symbol not just for his life, but for any man or woman’s life, and ultimately for the lifespan of humanity. The attributes that work toward sustainability at an individual level are equally valuable in a large society, Ayres says, and today’s “sprint culture” would do well to reconsider the concept of pacing. He also touches on the atom bomb, human evolution, the U.S. crisis in physical fitness and the reasons for following a vegetarian diet. But for all its peripatetic allegory, The Longest Race is always the story of one epic 50-mile race in all its technical and visceral elements, and also a celebration of the sport of running and of our ability to keep running in changing times. For those readers inspired by his story, the appendix offers practical advice to the aspiring ultrarunner. This review originally ran in the October 19, 2012 issue of Shelf Awareness for Readers. To subscribe, click here, and you’ll receive two issues per week of book reviews and other bookish fun! Rating: 8 miles to go. EDIT: See also my father’s glowing review of same.